The dead are with us. At least that’s what most religious cultures tell us. In some form or other, the living remember the dead, whether it is one special figure who binds a community, like Jesus, or the more amorphous, but still community forming, collective of ancestors who serve as the focal point of living memory. 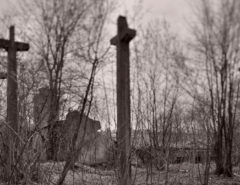 In so many religious cultures the fate of the living and the fate of the dead are intermingled and intimately connected, and the care and concern from either side can have monumental effects on all. Ritual, a core element in any religious culture, helps to structure the interactions between the spirits of the dead and the actions of the living, ordering objects in space, defying the passage of time, and communicating messages about morality and values to participants and observers. 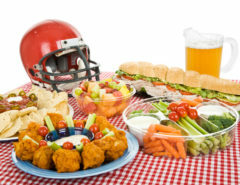 Throughout human history, rituals for the dead have been integral to social order and cultural meanings, bearing on the emotional and psychological state of the living and unifying a community around shared identities and purposes. 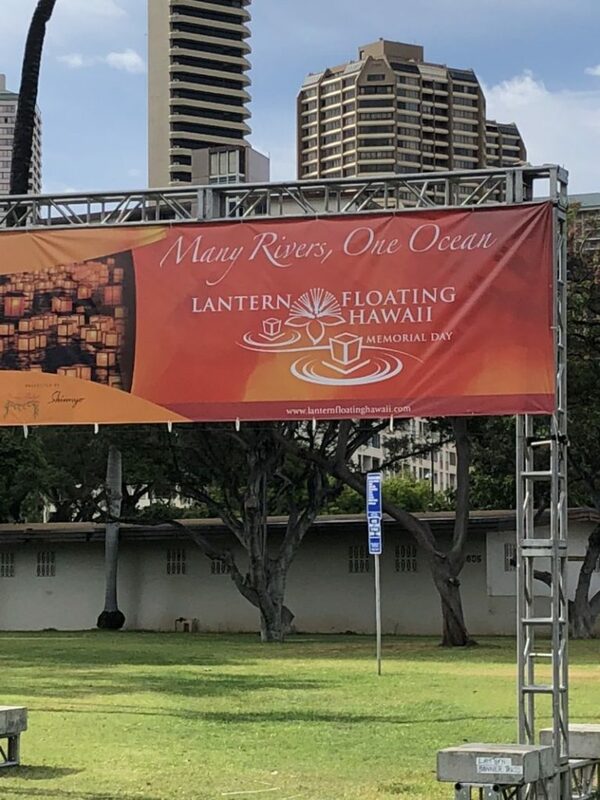 The Lantern Floating Ceremony, held every Memorial Day in Honolulu, Hawaii, for the last twenty years by the Shinnyo-en school of contemporary esoteric Buddhism, is an illustrative example of these ritual elements, but also a splendid expression of the many cultural forces shaping how the living relate to the dead in the second half of the twentieth century and into the early decades of the twenty-first. I had the privilege of participating in and observing the event this year, a serendipitous invitation that caught both my scholarly interest as someone who has spent a career researching death and religion, and my personal interest as a son who had just lost his mother over a year earlier. Many components of the experience stand out in my memory, and they were particularly fascinating for someone who pays attention to and studies changing attitudes and practices surrounding death in America. Beyond simply the beauty of the beach location where all this took place, some of the scenes from the day also radiated beauty, and power, and profound emotional energies. Indeed, the overall impact of the ceremony left a strong impression on me as I found myself both identifying and empathizing with those living with loss, and analyzing and critiquing the collective representations of death at work in the spectacular scene all around me. The draw of the ceremony for others was evident even before it began. Long lines of people early in the morning were waiting to enter tents where they would construct the floating lanterns that later in the evening are sent out for the spirits of the dead, bearing their personal messages. On the calming waters of the ocean bay, the living will use lanterns as a medium for some form of communication, connection, or communion with the spirits who will, we all hope, receive, read, and be liberated by those messages. Many in line were pilgrims who traveled from other parts of the world to be at this annual ritual; but a great many were local Hawaiians, a cultural presence in all aspects of the ritual, it seemed to me, and a force shaping the tone and texture of this Buddhist ceremony. By the start of the ceremony around 7:30pm, over 50,000 people from Hawaii, the US mainland, Japan, Australia, France, and across the globe, congregated and waited in the warmth—sometimes with clouds and rain blowing in and out—of the relatively small strip of beach. 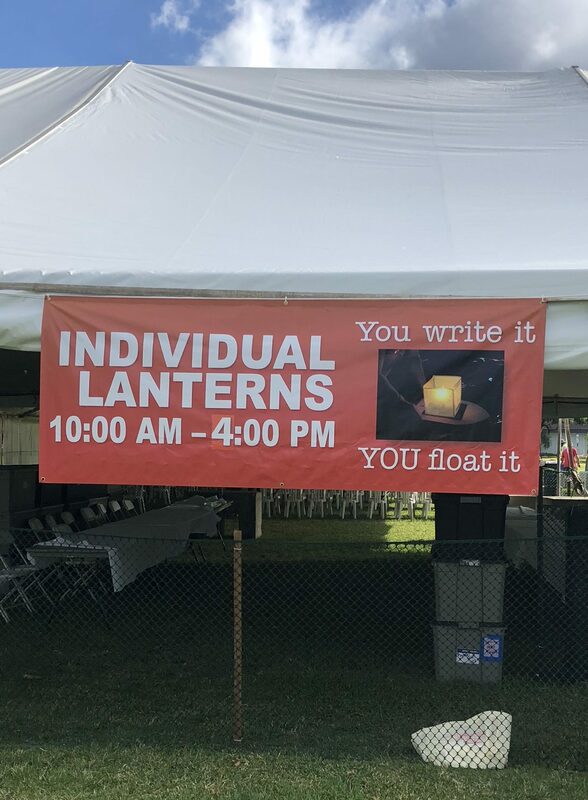 Out of that 50,000, 7,000 or so were waiting to send their personalized, or in some cases collectively designed, lanterns into the relatively still waters. The ceremony itself is in its twentieth year, a fitting and illustrative expression of key components of this particular brand of modern Buddhism but also, in its way, an encapsulation of 21st century trends in American public religious death and mourning rituals. The rich, vibrant mixing of different cultural elements in the setting, staging, words, music, performance, objects, and people highlighted during the ceremony before the release of the lanterns was anchored in a distinctive Shinnyo-en religious cultural cosmology. But I also suspect there were other religious cosmologies at work here, though not in conflict with or challenging to the sacred esoteric Buddhist notions animating this service, but in harmony with them, or at least apparently in harmony. Here we have, at one level, an image of multiple religious cultures cohering and integrating in common action, in stark contrast with the more common historically-rooted public image of religions in mortal combat over politics and fear. Over the course of the ceremony, a vibrant mixture of religious cultures surfaced and captured my attention as both a participant in the middle of all this vibrancy and effervescence, and a scholar who works with a broad-based conceptualization of religion and what might count as sacred, especially when it comes to the topic and experiences of death. Hawaiian political leaders and indigenous leaders and musical performers were singled out and shared the stage, tapping into and integrating local sacred sources of pride and identity. 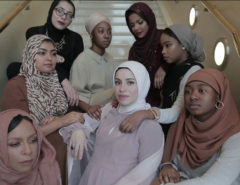 Religious leaders from local communities, including Muslims, Hindus, Jews, Catholics, Protestants, and other representatives participated in and were identified from the stage, displaying the interfaith fabric that is growing more complex and diverse in American public life in the twenty-first century. The centrality of the American military presence in Hawaii, a surprising and commanding element in the ceremony, surfaced in the introduction of key military leaders and the repeated reminders to remember the sacrifices of American soldiers (an element that should not be surprising at all given the occasion of the ceremony, the American holiday Memorial Day, which is so closely associated with war and military death). Media played a substantial role in the ceremony, with large monitors transmitting images in real-time of ritual events on stage, individual grieving faces from the hundreds lining the beaches, and lanterns floating out to sea, all combining to help generate and sustain the sacred energies and hopes for those present in the flesh, but also via online mechanisms allowing for virtual but very real participation and engagement with the activities. Finally, but most importantly, is the authorial and authorizing Shinnyo-en Buddhist religious culture, which provides the historical roots, ritual frameworks, and mythological touchstones through which all of this transpires and succeeds. Each of these religious threads can be disentangled from the others and studied on their own; and all of the threads together has its own unique sociological and cultural significance that bears on the present. 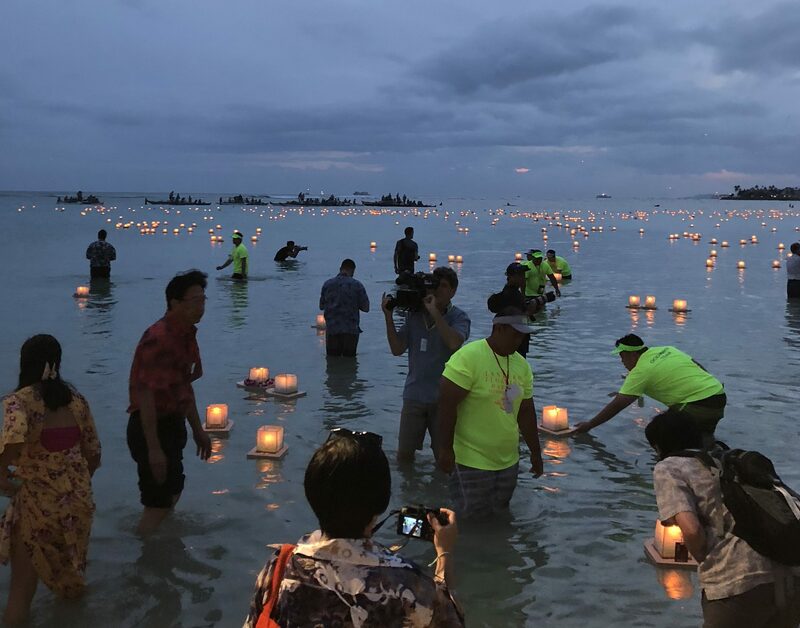 But whatever the approach or focus when writing and reflecting back on the event, the Lantern Floating ceremony presents a unique and compelling phenomenon for further consideration. These intellectual stirrings and comments about my own participation in the ceremony and observations about it, however, have not yet touched on the most impressive and moving experience during my time that evening. It was not, I must admit, putting my own lantern in the water for my mother and watching it, with my own inept attempt at words to connect us, floating out with thousands of others into the ocean at sunset in one of the more gorgeous locations on earth. No, it was rather when I turned around, away from the flickering lights and orange sky reflecting on the water, and toward the seated audience of hundreds behind me in a section on the beach with a view of lanterns floating on the sea. As soon as my sight shifted from my feet on the shore walking out of the water to the faces of those seated under bright white lights for the cameras, I was taken aback and startled, and then tremendously touched by what I saw. Almost everyone seated on the chairs was Asian and over sixty, and it looked like every single one of them had tears in their eyes. This is obviously based on the immediate impression and memory of the moment, not on any surveys or statistical data. But the initial emotional impact hit me hard and left me feeling more tuned in to their sadness and experiences there than my own. I could not take my eyes off of the group so brightly lit in front of me, but also knew that I was uncomfortable gazing in their direction as I walked away from the crowds on the beach. Even as lanterns floated in a picturesque, sunset setting, including my own to my dear and sorely missed mother, my empathy and intellectual curiosity focused on these more elderly people sitting near the beach—with many actually leaning in toward the water on their right. The thoughts that jumped to mind centered around questions like: Who are they, and why are they there? And why is this so sad for them? With more time to reflect on the individuals in those chairs, and greater distance from the vivid moment itself, I find myself especially curious about whether the ceremony was sacred for them and if so, how so—and do their religious experiences line up at all with any of the religious cultures in the mix I sketched earlier? Are they memorializing individual family and friends who have died, ancestors from distant generations, lost cultural traditions no longer viable in the US, deceased Shinnyo-en community members, American military heroes who have died for the nation, or maybe even those who died as a result of American military force. The Lantern Floating ceremony puts this foundational intimacy with the dead on display in a way that explicitly communicates the long and deep-rooted human tendency to keep the dead close by. It also subtly performs a local intervention on this beach in Hawaii to remind all those present and participating, either in person or virtually, that across many social divisions, in the face of local histories replete with power struggles and conflict, and with the hope of bringing relief from suffering and cultivating compassion, the dead have a role to play. The religious cultures present at the ceremony do not simply coexist; they coalesce around the dead—the potency of memories, the crush that comes with grief, the solace from communing with ancestors, the desire for maintaining their presence—in ways that make the ritual so potent and effective. It strikes at the heart of individual participants, who are there for any number of reasons, who bring with them whatever spiritual resources and traditions work to connect them with the dead, and who by being involved in the ritual mix, virtually or in the flesh on the beach, can potentially reestablish communities that transcend and incorporate the realities of death.